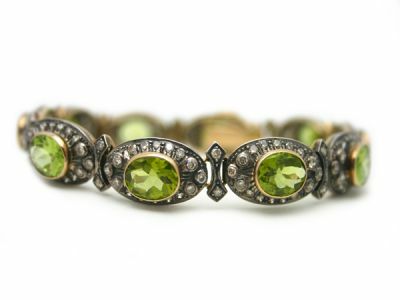 Elegant 18kt yellow gold and silver top bracelet set with ten bezel-set, oval facetted cut peridot weighing a total of 15.90 ct (MI) with a deep intense olive green colour. The bracelet is further enhanced by one hundred and eighty bezel and bead-set, round brilliant cut diamonds with an estimated total weight of 3.68 ct (SI, M-N). At approximately 8.25 inches in length, the bracelet weighs about 29.20 grams and secures with a box clasp and extra safety catch.